Yale’s Graduate School of Arts and Sciences offers one of the most generous financial support programs for Ph.D. students and their families. Starting in academic year 2018-2019, an annual subsidy of $4,600 is available to Ph.D. students with a child up to the age of 12. For additional children under the age of six, an annual subsidy of $1,000 per child will be made. The Graduate School provides outstanding health care coverage at Yale Health, which provides full coverage for all Ph.D. students and their children. Coverage is also available from the Graduate School for half the cost of the two-person plan when the Ph.D. student is enrolled with a spouse. See this summary table for full details. An annual subsidy of $4,600 is provided to Ph.D. students with a child up to the age of 12. If students are enrolled on the family plan, which also insures their spouse, the family subsidy will automatically be applied to their student account to cover the spousal portion of the insurance premium. 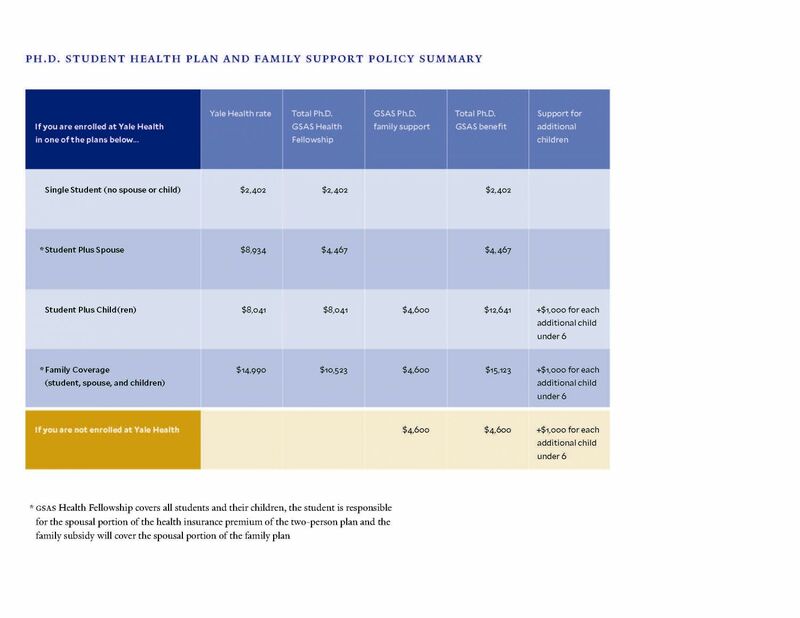 If students have other options for spousal health care, they can use the money for childcare or any other family needs necessary. For additional children under the age of six, students will receive an annual subsidy of $1,000 per child. The annual subsidy payments will be distributed twice per academic year. Each term a payment of $2,300 and $500 for each additional child will be made. The enrollment periods for the policy will coincide with the enrollment periods for Yale Health, which are August 1– January 31 for the fall term and February 1 – July 31 for the spring term. The Graduate School Financial Aid Office will send out enrollment forms before the start of each term and students will need to enroll for each term they are eligible for. Students who have a new birth or adoption event after the initial enrollment period will receive a pro-rated subsidy for that semester, once they submit the Mid Term Birth/Adoption Event Form. This form is to be used only for new birth/adoption events during the current term; otherwise, the Ph.D. Student Family Support form must be used for enrollment. Importantly, access to the Ph.D. Student Family Support subsidy does not require means testing. This avoids the need for students to submit financial documents or be subject to income thresholds, and also minimizes the need to divert funds into administrative costs. We are committed to helping all Ph.D. students succeed during their time at Yale. In addition, our Parental Relief Policy offers one fully-funded extra term in graduate school per child, with the student’s academic clock stopped. For more information, please see these Ph.D. Student Family Support Policy FAQs. You may contact gradfinaid@yale.edu if you have other questions.